Super north conditions today meant challenging launches at Kahana but also a good chance to cross the bay. Ray and I managed to get up from the low launch on the inside ridge but after a couple tries each to cross the bay, Ray had to leave. Just as he left, Sandy launched low on the north launch, and I finally made it across and got up over Kaaawa. 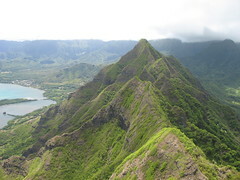 As I made my way to Kualoa and back, Sandy soared the north flow over the ridge while Greg launched from the high launch on the inside ridge and battled the rotor all the way down to the LZ. The north winds at Kahana are fickle forces, but there's nothing like a trip to Kualoa to remind us why we like them.